2014-01-17: Added non-negative matrix factorization (see option NMF option in Utilities). The HELP button opens a PDF file with all the technical details (well, almost all). Non-invasive scalp measurements of electric potential differences (EEG) [as well as magnetic field measurements (MEG)] can be used for estimating the electric neuronal activity distribution (current density vector field) on the cortex. The methods proposed here are LORETA (Pascual-Marqui 1999, Pascual-Marqui et al. 1994), standardized LORETA (sLORETA) (RD Pascual-Marqui 2007, Pascual-Marqui 2002), and exact LORETA (eLORETA) (RD Pascual-Marqui 2007, Pascual-Marqui 2009, R. D. Pascual-Marqui et al. 2011). See e.g. (Worsley et al. 2005). However, from a formal point of view, there are many different ways to define similarity between signals. 1. Lagged coherence and lagged phase synchronization (Roberto D Pascual-Marqui 2007, R. D. Pascual-Marqui et al. 2011). 2. Dynamic intracortical connectivity in terms of senders, hubs, and receivers (Pascual-Marqui and Biscay-Lirio 2010). 3. Partial coherence fields (Roberto D Pascual-Marqui et al. 2011). 4. Isolated effective coherence (RD Pascual-Marqui et al. 2014, Roberto D Pascual-Marqui et al. 2014). Another new method proposed here for discovering generalized functional connectivity, using a different approach, based on methods from the relatively recent branch of statistics known as “functional data analysis” (Ramsay and Silverman 2005), can be found at (Pascual-Marqui and Biscay-Lirio 2011). 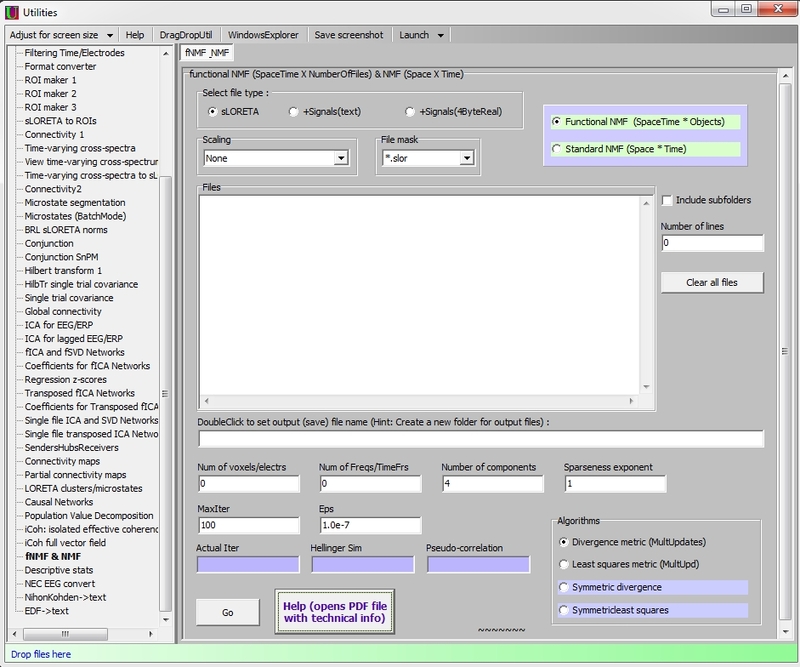 All these methods and much more are programmed and available in the alpha LORETA-KEY software package. Read the notes before downloading and extracting and running! This software is only for advanced users of the sLORETA / eLORETA software package. This is alpha in-house software, not ready for public distribution. It contains many new analysis tools, and it lacks documentation. Use at your own risk, and do not expect immediate help. “LoretaKey.exe” is a “self-extracting” archive. “LoretaKey.exe” is not an installation program. When you run it, the program will allow you to choose a place where it will create a folder named “LoretaKey” with the package. The extraction needs the password shown above. You can only use this software if you have administrator rights. which will create a desktop shortcut to the main program, and it will associate files of the type “*.slor” and “*.crss” with the Viewer. If your program version is older than the current version shown above, you may download the newer version. Ensure you are not running LORETA, then OVERWRITE the previous version with the new package, and repeat step 6 above. Cross-frequency couplings are assessed by computing complex-valued coherences between Fourier transform coefficients at different frequencies. This methods detects all forms of amplitude-amplitude, phase-amplitude, and phase-phase coupling / information flow. Actually, lagged physiological coupling / information flow is computed (i.e. where low resolution / volume conduction appropriately modeled and eliminated). 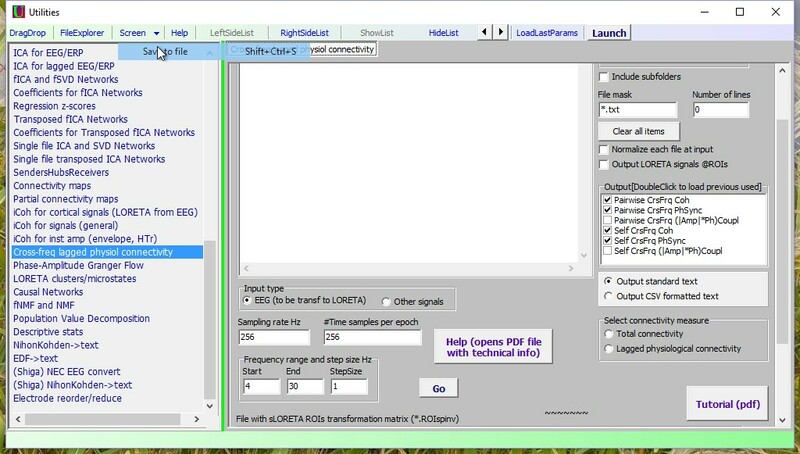 A second method uses Hilbert transformation and computes Granger causality measures of connectivity between instantaneous amplitude signals (envelopes) and phase signals, for collection of user-specified frequency bands. A brain microstate is characterized by a unique, fixed spatial distribution of electrically active neurons with time varying amplitude. It is hypothesized that a microstate implements a functional/physiological state of the brain during which specific neural computations are performed. Based on this hypothesis, brain electrical activity is modeled as a time sequence of non-overlapping microstates with variable, finite durations (Lehmann and Skrandies 1980, 1984; Lehmann et al 1987). In this study, EEG recordings from 109 participants during eyes closed resting condition are modeled with four microstates. In a first part, a new confirmatory statistics method is introduced for the determination of the cortical distributions of electric neuronal activity that generate each microstate. All microstates have common posterior cingulate generators, while three microstates additionally include activity in the left occipital/parietal, right occipital/parietal, and anterior cingulate cortices. This appears to be a fragmented version of the metabolically (PET/fMRI) computed default mode network (DMN), supporting the notion that these four regions activate sequentially at high time resolution, and that slow metabolic imaging corresponds to a low-pass filtered version. In the second part of this study, the microstate amplitude time series are used as the basis for estimating the strength, directionality, and spectral characteristics (i.e., which oscillations are preferentially transmitted) of the connections that are mediated by the microstate transitions. The results show that the posterior cingulate is an important hub, sending alpha and beta oscillatory information to all other microstate generator regions. Interestingly, beyond alpha, beta oscillations are essential in the maintenance of the brain during resting state. "RD Pascual-Marqui, D Lehmann, P Faber, P Milz, K Kochi, M Yoshimura, K Nishida, T Isotani, T Kinoshita. “The resting microstate networks (RMN): cortical distributions, dynamics, and frequency specific information flow”. 2014/November/07. arXiv:1411.1949. http://arxiv.org/abs/1411.1949"
Baccala, L. A. and Sameshima, K. (2001) Partial directed coherence: a new concept in neural structure determination. Biol Cybern, 84(6), pp. 463-74. Pascual-Marqui, R. (2007) Discrete, 3D distributed, linear imaging methods of electric neuronal activity. Part 1: exact, zero error localization. arXiv: 0710.3341 (http://arxiv.org/pdf/0710.3341). Pascual-Marqui, R., Biscay, R., Bosch-Bayard, J., Lehmann, D., Kochi, K., Yamada, N., Kinoshita, T. and Sadato, N. (2014) Isolated effective coherence (iCoh): causal information flow excluding indirect paths. arXiv preprint arXiv:1402.4887 (http://arxiv.org/abs/1402.4887). Pascual-Marqui, R. D. (1999) Review of methods for solving the EEG inverse problem. International journal of bioelectromagnetism, 1(1), pp. 75-86. Pascual-Marqui, R. D. (2002) Standardized low-resolution brain electromagnetic tomography (sLORETA): technical details. Methods Find Exp Clin Pharmacol, 24 Suppl D, pp. 5-12. Pascual-Marqui, R. D. (2007) Instantaneous and lagged measurements of linear and nonlinear dependence between groups of multivariate time series: frequency decomposition. arXiv preprint arXiv:0711.1455 (http://arxiv.org/abs/0711.1455). Pascual-Marqui, R. D. (2009) Theory of the EEG Inverse Problem. in Tong, S. and Thakor, N. V., (eds.) Quantitative EEG Analysis: Methods and Clinical Applications,Boston, MA: Artech House. pp. 121-140. Pascual-Marqui, R. D. and Biscay-Lirio, R. J. (2010) Dynamic interactions in terms of senders, hubs, and receivers (SHR) using the singular value decomposition of time series: Theory and brain connectivity applications. arXiv preprint arXiv:1009.0796 (http://arxiv.org/abs/1009.0796). Pascual-Marqui, R. D. and Biscay-Lirio, R. J. (2011) Interaction patterns of brain activity across space, time and frequency. Part I: methods. arXiv preprint arXiv:1103.2852 (http://arxiv.org/abs/1103.2852). Pascual-Marqui, R. D., Biscay, R. J., Bosch-Bayard, J., Lehmann, D., Kochi, K., Kinoshita, T., Yamada, N. and Sadato, N. (2014) Assessing direct paths of intracortical causal information flow of oscillatory activity with the isolated effective coherence (iCoh). Front Hum Neurosci, 8. Pascual-Marqui, R. D., Biscay, R. J., Valdes-Sosa, P. A., Bosch-Bayard, J. and Riera-Diaz, J. J. (2011) Cortical current source connectivity by means of partial coherence fields. arXiv preprint arXiv:1108.0251 (http://arxiv.org/abs/1108.0251). Pascual-Marqui, R. D., Lehmann, D., Koukkou, M., Kochi, K., Anderer, P., Saletu, B., Tanaka, H., Hirata, K., John, E. R., Prichep, L., Biscay-Lirio, R. and Kinoshita, T. (2011) Assessing interactions in the brain with exact low-resolution electromagnetic tomography. Philos Trans A Math Phys Eng Sci, 369(1952), pp. 3768-84. Pascual-Marqui, R. D., Michel, C. M. and Lehmann, D. (1994) Low resolution electromagnetic tomography: a new method for localizing electrical activity in the brain. Int J Psychophysiol, 18(1), pp. 49-65. Ramsay, J. and Silverman, B. W. (2005) Functional data analysis, 2nd ed., New York:Springer. Worsley, K. J., Chen, J.-I., Lerch, J. and Evans, A. C. (2005) Comparing functional connectivity via thresholding correlations and singular value decomposition. Philosophical Transactions of the Royal Society B: Biological Sciences, 360(1457), pp. 913-920. Functional connectivity is of central importance in understanding brain function. For this purpose, multiple time series of electric cortical activity can be used for assessing the properties of a network: the strength, directionality, and spectral characteristics (i.e. which oscillations are preferentially transmitted) of the connections. The partial directed coherence (PDC) of (Baccala and Sameshima 2001) is a widely used method for this problem. The three aims of this study are: (1) To show that the PDC can misrepresent the frequency response under plausible realistic conditions, thus defeating the main purpose for which the measure was developed; (2) To provide a solution to this problem, namely the “isolated effective coherence” (iCoh), which consists of estimating the partial coherence under a multivariate autoregressive model, followed by setting all irrelevant associations to zero, other than the particular directional association of interest; and (3) To show that adequate iCoh estimators can be obtained from non-invasively computed cortical signals based on exact low resolution electromagnetic tomography (eLORETA) applied to scalp EEG recordings. To illustrate the severity of the problem with the PDC, and the solution achieved by the iCoh, three examples are given, based on: (1) Simulated time series with known dynamics; (2) Simulated cortical sources with known dynamics, used for generating EEG recordings, which are then used for estimating (with eLORETA) the source signals for the final connectivity assessment; and (3) EEG recordings in rats. Lastly, real human recordings are analyzed, where the iCoh between six cortical regions of interest are calculated and compared under eyes open and closed conditions, using 61-channel EEG recordings from 109 subjects. During eyes closed, the posterior cingulate sends alpha activity to all other regions. During eyes open, the anterior cingulate sends theta-alpha activity to other frontal regions. All the technical details can be found in (RD Pascual-Marqui et al. 2014, Roberto D Pascual-Marqui et al. 2014). 1Department of Psychiatry, Shiga University of Medical Science, Japan; 2The KEY Institute for Brain-Mind Research, University of Zurich, Switzerland; 3Department of Neuropsychiatry, Kansai Medical University, Japan. The “maximum similarity correlation” definition introduced in this study is motivated by the seminal work of Székely et al on “distance covariance” (Ann. Statist. 2007, 35: 2769-2794; Ann. Appl. Stat. 2009, 3: 1236-1265). Instead of using Euclidean distances “d” as in Székely et al, we use “similarity”, which can be defined as “exp(‑d/s)”, where the scaling parameter s>0 controls how rapidly the similarity falls off with distance. Scale parameters are chosen by maximizing the similarity correlation. The motivation for using “similarity” originates in spectral clustering theory (see e.g. Ng et al 2001, Advances in Neural Information Processing Systems 14: 849-856). We show that a particular form of similarity correlation is asymptotically equivalent to distance correlation for large values of the scale parameter. Furthermore, we extend similarity correlation to coherence between complex valued vectors, including its partitioning into real and imaginary contributions. Several toy examples are used for comparing distance and similarity correlations. For instance, points on a noiseless straight line give distance and similarity correlation values equal to 1; but points on a noiseless circle produces near zero distance correlation (dCorr=0.02) while the similarity correlation is distinctly non zero (sCorr=0.36). In distinction to the distance approach, similarity gives more importance to small distances, which emphasizes the local properties of functional relations. This paper represents a preliminary empirical study, showing that the novel similarity association has some distinct practical advantages over distance based association.